owns, dates back to 1963 or 1964. This is Part 2 of a multi-part series in which Marc Steinberg, author of Anime's Media Mix, lets us into his own world of collectibles. Curious? Read the first part here. So how did I get stuck on the stickers? And how did they become so important to Anime’s Media Mix? I first read about them in a booklet included with the DVD set of the original Tetsuwan Atomu in Japan, in a short but fascinating section on goods sold with the original series. 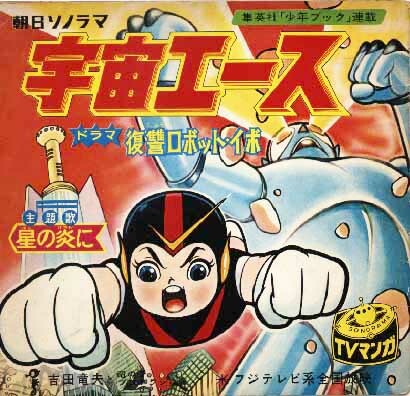 From there I happened on the wonderful resource book of Atomu stickers put together by Tsunashima Ritomo, Atomu shiiru to Tetsujin wappen: 1963-1966 (Astro Stickers and Gigantor Badges: 1963-1966). Tsunashima is one of a small group of writer-collectors who spent his time and energy chronicling the material culture of early 1960s children’s culture in Japan (two other impressive writers are Machida Shinobu and Kushima Tsutomu). But if I knew what the stickers looked like, what size they were, and what kids of the time did with them, well, that part required a trip to Mandarake in Nakano, Japan, to see and feel first-hand what they were like. As anyone who’s done archival work knows well, there’s a kind of thrill of discovery and contact that comes with working in an archive. You’re touching material documents of a particular time and place. As you leaf through them the materials give you a sense of time travel, of being in the era, of truly living the excitement. I first felt this in a visceral sense when I was reading through childrens’ magazines of the 1950s and 1960s. And I also felt this at the toy museums (granted, without the privilege of actually touching the stuff). 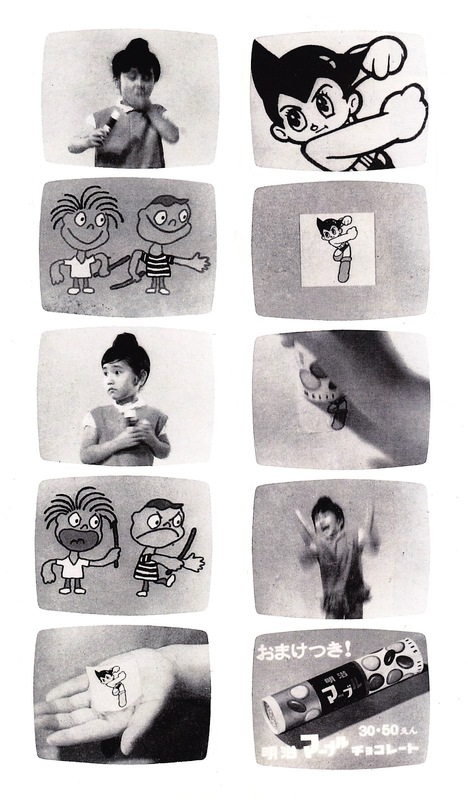 But the strongest “WOW” moment during this project came when I actually came across a number of these "Atomu & friends" stickers in the Nakano Mandarake. Part of the store is a veritable time warp to another era; Mandarake absolutely lives up to its grandiose self-description as the “Rulers of Time.” Going to the store is like visiting a pop-cultural archeological dig into the past. While I’d been to Mandarake's less impressive (but still priceless) Shibuya store innumerable times, visiting the Nakano location was like stepping back into 1960s freebee culture – complete with Atomu stickers, Tetsujin badges, candies of the time, and everything. All the things that libraries don’t archive. All the things I was writing about. of the first to feature Atomu. It’s there that I found the sticker I initially wanted to put on the cover of my book (see main image above). A single sticker of Atomu, still encased in its plastic wrapper, originally included as an in-pack premium, probably dating to late 1963 or 1964. It’s actually the subject of a Marble Chocolates television ad from 1964, one of the first to see the animated character (as sticker) displace the former star of Meiji advertising, Uehara Yukari (left). So why couldn’t I use this sticker as the cover? In a thoughtful review of my book, Jonathan Clements wonders why not feature Atomu on the cover, or better yet, the more contemporary Suzumiya Haruhi (who is so important to the later section of my book)? He suspects there is a legal story behind it, and he’s quite right. 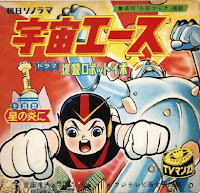 While the people at Tezuka Production (the company that holds the rights to the Atomu image) were generous in granting permissions to use Tezuka’s trademark character inside the book, they were more cautious about granting me permission to use the sticker image on the cover. The sticker was, after all, a Meiji Seika product. I should contact Meiji Seika; if they granted me the right to use the sticker image, so would Tezuka Production. As I suspected at the time, that proved to be impossible. In this case there was no response from Meiji, and the clock was ticking on my book. In the meantime, Brad Norr Design came up with an absolutely fantastic cover for my book – the present cover. I can describe why this cover just works. As Clements rightly suspects, part of the reason lies in not using an existing character. More books than I can count feature the iconic Atomu on their covers (including, I might note, the invaluable resource Clements put together with Helen McCarthy, The Anime Encyclopedia, as well as Fredric Schodt’s incisive and informative The Astroboy Essays). But maybe even more to the point, there was something refreshing about stepping out of the existing system of serial relations across media that is the subject of my book, and that my book would have supported if it had used a recognizable character, whether it be Atomu or Suzumiya Haruhi. There was also something appropriately generic about the character invented for Anime’s Media Mix – something of a mix between Atomu, the Atomu knock-off Uchû Ace (at right) and Cap’n Crunch (which itself was the inspiration for a counter-stream of toys I’ll bring up in a future post: the vinyl art toy movement in Japan that got its start with Bounty Hunter’s “Kid Hunter”). 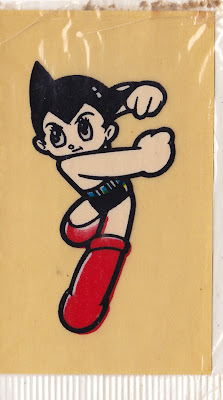 Add in the retroesque color scheme and the print-outside-the-lines effect that mimics the print style of the time (found in the Atomu stickers in particular) and note the way the “M” for Media Mix uses the same font as Meiji’s logo of the time. Finally, the cover gestures towards the proliferation of character images across media, evoked literally in the sticker and TV references, and figuratively in the out-of-frame and out-of-medial-bounds framing of the character. What can I say, except that I was instantly won over. This was the cover I was looking for.